"One of our family's favorites, it's also great when made with crab meat instead of the shrimp." Bring a large pot of lightly salted water to a boil. Add linguine pasta, and cook for 8 to 10 minutes, or until al dente; drain. In a large skillet, melt the butter over medium heat. Stir in cream, and season with pepper. Cook 6 to 8 minutes, stirring constantly. Stir Parmesan cheese into cream sauce, stirring until thoroughly mixed. Blend in the pesto, and cook for 3 to 5 minutes, until thickened. Stir in the shrimp, and cook until they turn pink, about 5 minutes. Serve over the hot linguine. 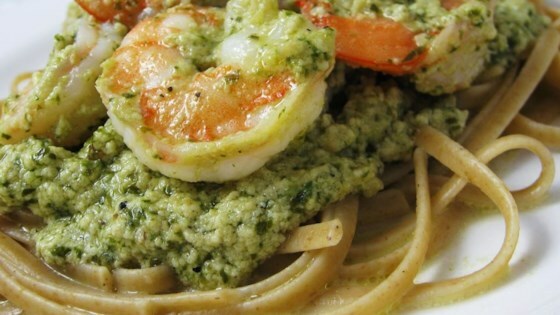 Creamy pesto sauce, linguine, and shrimp are a quick 30 minutes away! I made this a little lower in fat by using lowfat margarine and half-and-half and it was awesome.